The Depression was a bleak time for your mother. Dad had to find work where he could. A plumber by trade, maybe he fixed a sink one month, or maybe a pipe. His customers could hardly pay. He would bring home the few dollars and turn them over to your mom. She ran the household on a pittance. Four children at home meant that every penny had to stretch. One day, she opened a box of oatmeal and found me! It put a smile on her face that was normally strained from hardship. Quaker Oats had started putting glass dishes in with their oats. Other businesses followed. Your mom always kept her pink glass in a place of honor. She had worked so hard to scrimp and save for us, sometimes sneaking behind Dad’s back buying an extra piece that she coveted. When she passed away in the 1970s, I went home with you. Oh, happy days. Looking at me filled you with nostalgia. I reminded you of your mom and your childhood, of harder times and of rays of sunshine. You started adding to her collection. 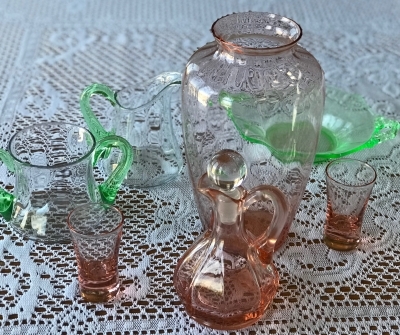 Going to auctions on the weekends became a great pastime for you, seeking out more Depression glass. You added greens, and yellows, carnival glass, and pretty plates. I’ll admit I felt a bit jealous. I didn’t feel special anymore, just one of many. You weren’t alone in your pursuit. Your peers joined in. Our values rose. When you went on vacation, you would scour antique stores. The fun was in the hunt. You bought a china cabinet to display us in. How pretty we looked with the lights dancing off of our multi-colors. We made you smile. Now you have lots of Depression glass and various other treasures that you enjoyed collecting, like Hummels, figurines, and plates. Later, you even added Precious Moments and Beanie Babies. The time has come to reduce your collections down to a precious few. By sheer volume, we’ve lost our uniqueness. Now our value isn’t in dollars, it is in your memories. Your other collectibles remind you of the hunt, but I am delightful because I remind you of your mom. You’ve asked your kids if they’ll take some of us. They took a piece or two, but they didn’t grow up during the Depression. They don’t have your memories, nor do your grandchildren. Take me! Take me! We had fun, didn’t we? So, I go with you to your new home. I am honored to remain part of your life. Someday, perhaps your granddaughter will look at me, remembering you, her sweet grandma and your stories; she will smile and want me after all.